As uninteresting and derivative as the original Purge was, I’ll give it credit for this: The Purge knew it was better to focus solely on the horrors happening to one group of people. We followed a family trying to survive the night together, and in turn, the stakes felt greater. On the other hand, while The Purge: Anarchy was a moderate step above what the original provided, one of its biggest problems was trying to juggle too many unnecessary characters at the same time. 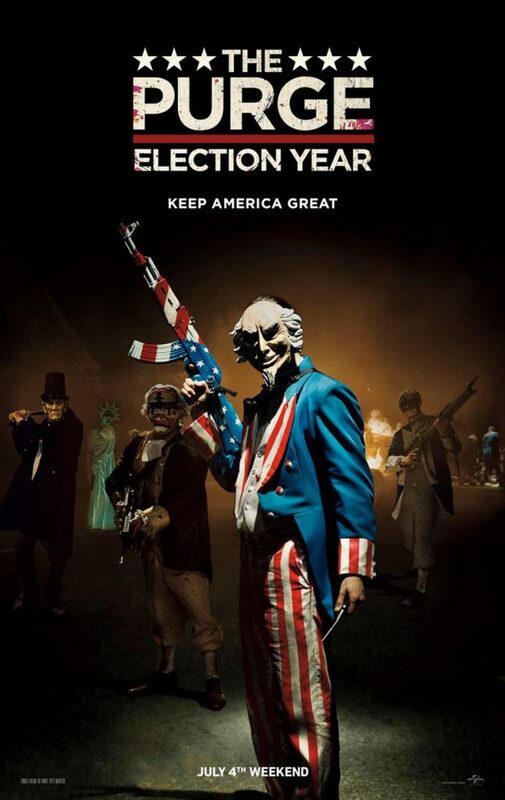 And in turn, The Purge: Election Year feels more or less the same in trying to handle too many stories simultaneously, but this time without the same level of tense thrills Anarchy provided. The Purge: Election Year is set in the year 2025. One day a year, for twelve hours, all crime across the United States, including torture and murder, is legal. Senator Charlene Roan (Elizabeth Mitchell,) on the other hand, is opposed to the annual purge and promises that if elected to presidency, her first order of action will be to remove the murderous holiday once and for all. With her numbers indicating a potential win, the government officials in favor of the purge plan to see to it that Ms. Roan won’t live long to potentially be president. And what better way to legally murder someone than on the violent day you hold so near and dear to your heart? There is quite a bit that The Purge: Election Year does try to do right. For instance, we see the welcome return of character Sergeant Leo Barnes (Frank Grillo) following alongside the senator to protect her throughout the story. And thankfully, it leads to the most interesting parts this movie has to offer. From the beginning of the picture, you stand behind the senator in her bid to rid America of the purge, in large part because you get to see front and center what happened to her family, and why it would lead her to want the holiday gone for good. And thanks to the fact that Barnes’ character was well motivated and established in the previous film, he’s allowed to just let loose and have fun murdering anyone who tries to attack the senator he’s sworn to protect. Additionally, another great idea tossed around in Election Year is how people of this “What if” world have started to work their lives around the purge the longer it exists. From seeing a manned ambulance riding around trying to help those who’ve been shot or maimed, to a “corpse collecting” service that attempts to clean up the carnage while everyone is busy shooting each other, it really helps make the world more believable in such an insane scenario. Along with the fact that groups such as Christian extremists, white supremacists and the snobbish entitled are examined every so often in the feature, it crafts some fun bursts of social examination alongside the mindless carnage. However, as fascinating as exploring this disheveled community we call America should be in a film like The Purge, it ends up leaving this massive impression that the film doesn’t quite know what it wants to be. If you want a tense, over the top thriller like Anarchy was, Election Year squanders its few and far between bursts of bloody violence in favor of stale exposition scenes. If you want a smart social commentary on the ever-changing state of the United States, this film steers away from it far too often. Instead of just trying to do one thing well, bloody thrills or smart social analysis, Election Year opts to just implement the occasional spark of either or, and only leaves a relatively mediocre experience in place of where the rest should be. It should also be noted that The Purge: Election Year tends to dive a bit too often into familiar racist tropes. The character of Joe Dixon (Mykelti Williamson) comes across as little more than a caricature instead of a character, and his placement in this story at all is questionable at best. When he shouts out a saying along the lines of “and we’re all packed in like fried chicken,” it marginally brands writer/director James DeMonaco as mishandling of what his characters should represent in working class struggles. I’m not against the idea of The Purge becoming an annual film franchise. As far-fetched as the idea of eugenics can be, the world that’s been created in this series can be a tense thrill-ride if done correctly, I just wish new films would be streamlined to figure out what they wanted to accomplish. Anarchy had its faults, but to this day remains the staple of what a Purge film should be: fast, fun suspense without the themes being shoved down your throat . If you’ve been a fan of this series since the beginning, I can guarantee you’ll still have fun. While the moments of action feel fewer than before, they’re bound to still put a smile on your face when they do manage to occur. And yet, even though The Purge: Election Year tries every route to improve upon its predecessors, it handles too much at once to be anything other than a middling distraction. As they say in politics, this election was close, but no cigar.